ItalianFriendFinder.com is a premium dating website for the people of Italian heritage and singles interested in dating Italian partners. The site was created specially for Italian singles where they can interact, find like-minded people, meet new friends and find romance and love. ItalianFriendFinder.com can boast a great membership data base of over 110 000 members. This number comprises active and inactive members. The members at ItalianFriendFinder.com are from Italy, but also such international locations as Europe, the UK, the USA, Canada, Australia, etc. ItalianFriendFinder.com operates on-line for Italian singles and those, who are interested in Italian dating. 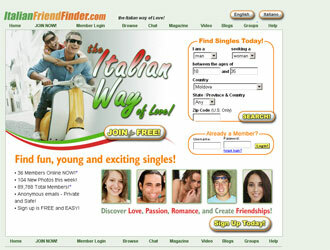 Prospective members can create profiles at ItalianFriendFinder.com totally free of charge. The compelling of profile is standard and requires answers to some basic questions. When you are done with your profile, you can always go back and make necessary corrections and additions. There is also a possibility of adding audio and video introductions to your profile. Profiles at ItalianFriendFinder.com also include “Personality Type” as a part of their profiles. This allows other members analyze how compatible with this or that member they are. Your type is determined with the help of psychometric evaluation based on your answers to the certain row of questions. Being a part of FriendFinder community, ItalianFriendFinder.com has the same format of features of the on line dating site. There are many social network features such as blogs, forums, on-line magazines and the like. However, from the very beginning this can seem overwhelming. At ItalianFriendFinder.com you will find different ways of search for your prospective match in accordance with different criteria. With the Silver or Gold membership one will get access to more search options. For communication ItalianFriendFinder.com offers private onsite e-mail box, instant messenger and chat rooms. Interaction is also possible via forums, blogs and magazine. A large portion of communicative features is available for premium members only. ItalianFriendFinder.com is available in two languages: English and Italian. In the ‘Help’ section you will find answers to the most frequently asked questions. There is also a customer service that one can connect on-line or by post mail. For payment ItalianFriendFinder.com accepts most of credit cards, PayPal, check or money order.